Lorri Allen, the Producer/Host of FamilyNet Television & Radio, interviewed Sheryl Roush, author of Heart of the Holidays today, on "Mornings with Lorri & Larry," broadcast from Atlanta, Georgia. Eat healthy, and drink wisely. LISTEN TO THE LIVELY INTERVIEW HERE. Set positive intentions for the day/event. Be optimistic and stay flexible… plans change. You reserve the right to say NO to invitations. Schedule OPEN TIME on your calendar for YOU. Have your meal catered…. or potluck/buffet style…. Have a "relief" staff to clear the table, and do the dishes. Plan the meal ahead of time, to avoid procrastination and stress. Serve dessert 1-2 hours after the meal, in another room. Focus on the “together-ness time” not the doing-ness tasks. Cherish the quality and sacred time. Bring fresh flowers to your hostess. 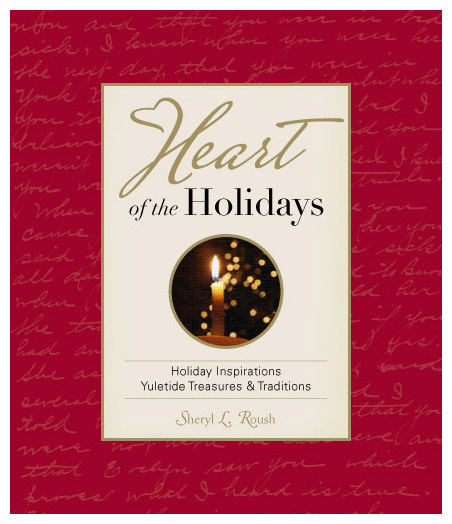 Sheryl read a couple of quotes by Erma Bombeck and Oprah Winfrey, and a short poem, “The Last Piece of Pie” by Lillian Berman published in from Heart of the Holidays. "Mornings" airs from 6-9 am Eastern on Sirius Satellite 161, and from 7-9 am Eastern on FamilyNet Television. This entry was posted on Tuesday, November 18th, 2008 at 9:10 pm	and is filed under Heart of the Holidays, Interviews, Thanksgiving. You can follow any responses to this entry through the RSS 2.0 feed. You can leave a response, or trackback from your own site. Sheryl–You were AWESOME on “Mornings” today! Thanks for being so peppy so early in the morning and sharing such great tips about Thanksgiving!